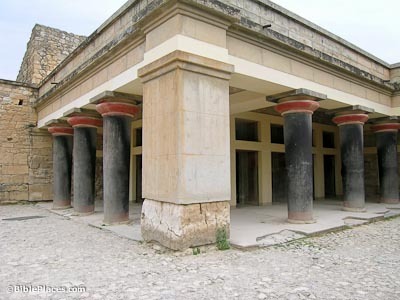 The Minoan palace at Knossos is the largest of all Minoan palaces, measuring 500 feet (156 m) by 500 feet (156 m) and covering over 5 acres. 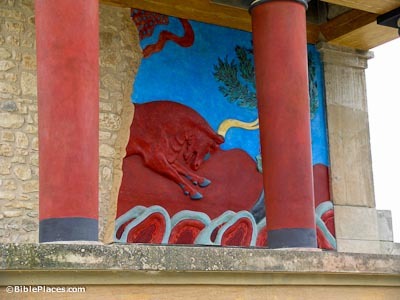 The plan of the palace reminded the principal excavator of Knossos, Sir Arthur Evans (1851-1941), of the labyrinth that imprisoned the Minotaur of Greek mythology, and he thus associated Knossos with King Minos. The remains which one sees there today are principally of the New Palace period (ca. 1750-1480 BC). According to legend, King Minos angered Poseidon, and because of this, Minos’ wife was made to fall in love with a white bull. The offspring was half-man and half-bull, the Minotaur. King Minos had Daedalus design and build a labyrinth to imprison the Minotaur. Each year, King Aegea of Athens had to send to Crete seven boys and seven girls as tribute to Minos to feed the Minotaur. One year, Aegea’s son Theseus joined this tribute procession and succeeded in killing the Minotaur. He escaped the labyrinth using a clew of thread given to him by Minos’ daughter, Ariadne. 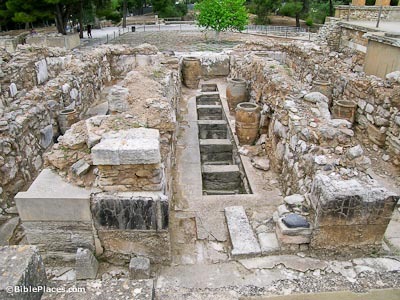 The Greek poet and prophet, Epimenides, was born in Phaistos, but spent most of his life in Knossos. He lived at the beginning of the 6th century BC. A quatrain in De Oraculis, which is attributed to him, is quoted in Titus 1 and Acts 17. These words are spoken by King Minos in praise of his father Zeus: “They fashioned a tomb for thee, O holy and high one – the Cretans, always liars, evil beasts, idle bellies! But thou art not dead: thou livest and abidest for ever, for in thee we live and move and have our being” (Gibson cited in Bruce 1977: 242). 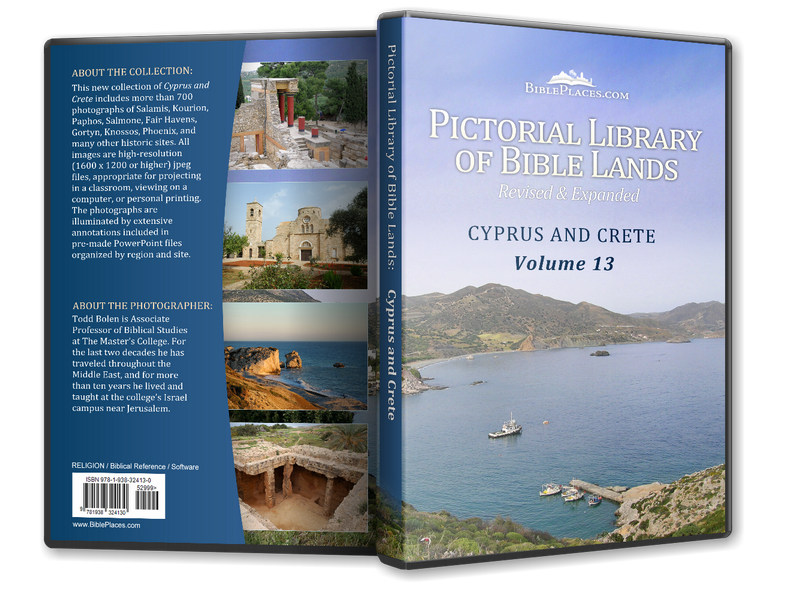 Seven Minoan palaces have been excavated on the island of Crete: Knossos, Phaistos, Malia, Gournia, Galatas, Petras, and Kato Zakros. The palaces share many features in common and were designed with facilities for fulfilling religious, economic, and royal functions. 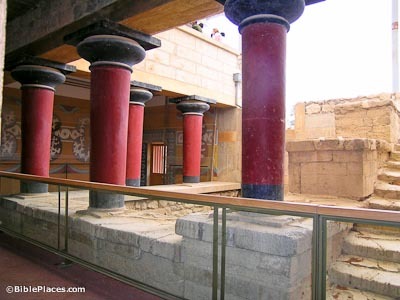 At Knossos, the palace is built around a large, rectangular paved courtyard that is twice as long as it is wide. The palace contains a large number of long, narrow storerooms, and its exterior walls have numerous projections and recesses.